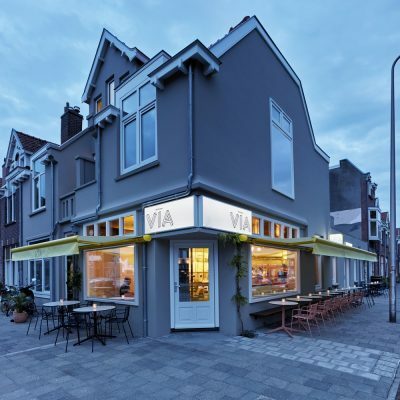 A new Da Portare VIA opens its doors in Utrecht, with the new VIA identity and design. 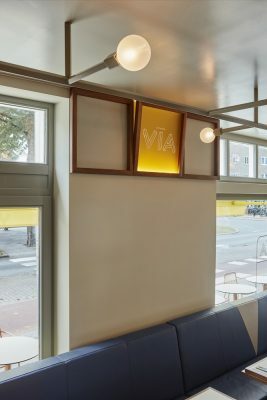 Studio Modijefsky has created a new spatial identity for VIA, which has been realized in Zwolle and Den Haag and continues to inspire new interiors throughout The Netherlands. At the core, is a strong design language that can be translated to every new location, creating a family for all the future VIA restaurants. The design principles, consisting of a material library, key shapes and custom designed elements are adjustable to the special quality of each individual site. Combining an array of wall finishes, flooring materials, a series of light fixtures and a unique palette of fabrics and colors. 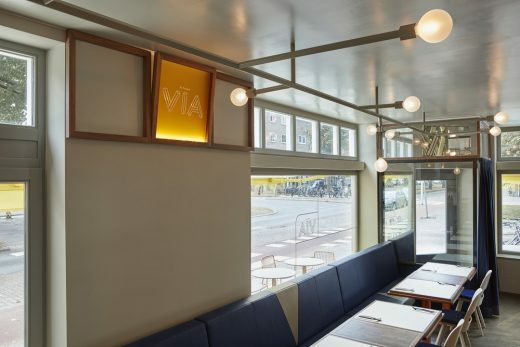 As a nod to VIA’s Italian component, various types of marble, mirror panels and walnut wood appear in the interior design. Playful accents, which were derived from the shape of the logo (diamond or half triangle) to create a strong sense of identity in the interior, are interspersed throughout the space and used to combine materials and integrate signage. 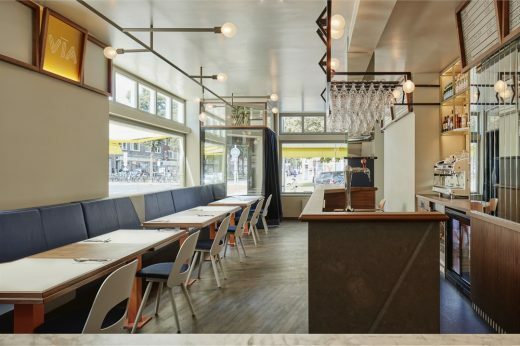 The shapes are also highlighted on the benches, the floor, the entrance curtain and the bar. 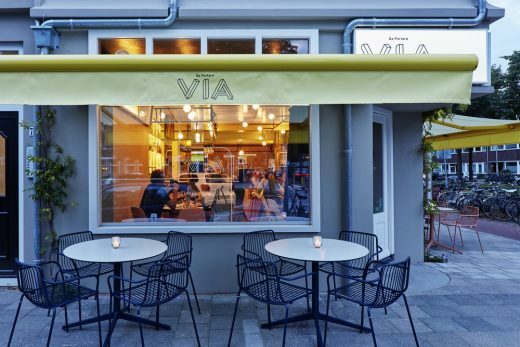 Bespoke connecting elements, which refer to one of VIA’s founding missions – to connect people who share a love of quality – appear in the interior. 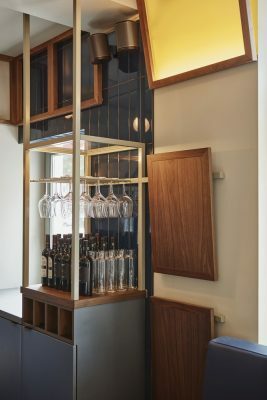 A petite vitrine on the bar promotes aperitif drinks and a row of custom made benches are paired with specially designed “connection tables” – which effortlessly turn two table tops into a group table by clicking in an extra piece. 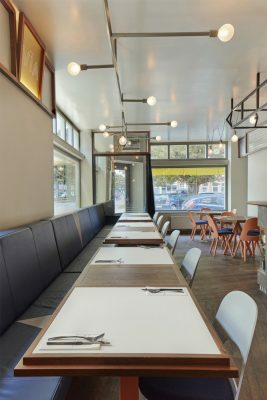 Aligned with the top stroke of the window frames, special wooden frames, occasionally angled forward, have been designed to accommodate the pizza menu, bar menu and the VIA logo. These frames form a continuous stroke of individual frames and are enhanced with the addition of indirect light and VIA’s bright yellow colour. A signature in the new design, is the lighting. 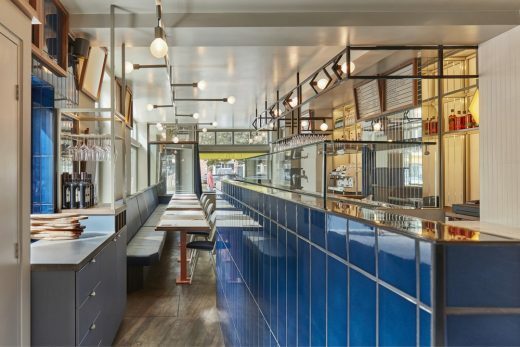 A colored steel structure hangs from the ceiling, supplying light to the tables beneath it. Several wires with light bulbs drop down from the structure, forming different figures and filling the space with illuminating spheres. 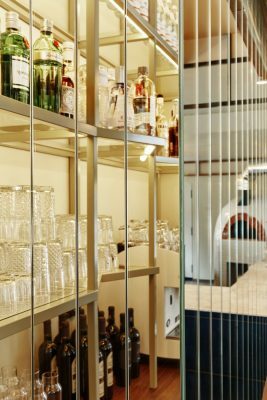 Above the bar, a steel structure outlines the area and steel triangles, reflected in a mirror on the wall, create diamond shapes. 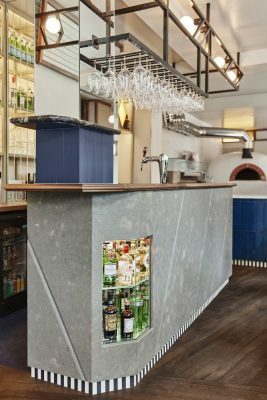 Sitting under a crown of light, the bar is covered in subtle grey marble slabs, placed in an angle with faceted edges. 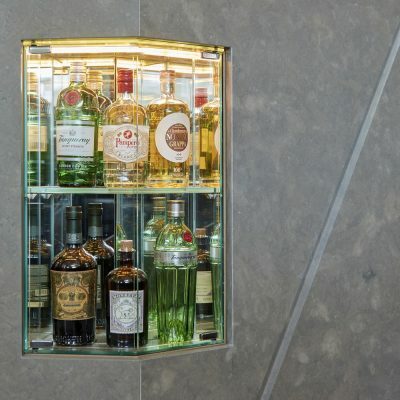 An integrated vitrine in the corner displays a comprehensive selection of spirits and gives the bar a quintessential Italian touch. The kitchen houses a round shaped oven covered in white square tiles, emphasizing the presence of the wood fire. 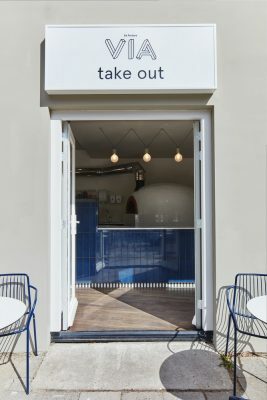 The open kitchen of the restaurant acts as a take-out kitchen at the same time, serving wood oven pizzas to the city. 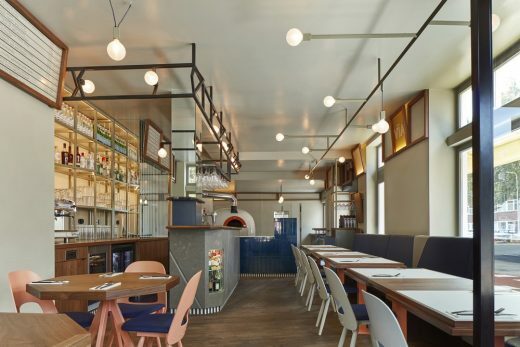 Throughout the interior, subtle winks to classic Italian décor make their presence known: from the black and white tiles covering the feet of the bar, vitrine in the bar and the pizza oven. 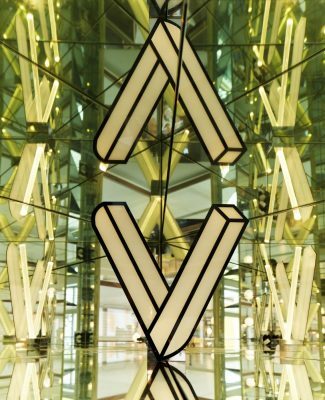 A ravish light box in the shape of a ‘V’ catches ones attention in the entrance. Surrounded by mirrors, the reflections create a profound and memorable VIA moment.